The utility room is now completed. Painted, shelved and ready for storage. I’ve also all but finished the high level kitchen shelving, just a small ‘decorative’ detail to add to the supports at either end of the shelf to cover up the new wood brackets with some of the reclaimed timber. I’ve also progressed with the flue guard that I’ve been building from various perforated steel sheets, solid lengths of aluminium and a resin based adhesive. It’s been slow going as I only stick one or two pieces at a time, then allow the joints 24+ hours to dry before moving on. But it’s pretty much there now, definitely finished in October. Other jobs this month have mainly been concerned with tidying things up, getting ready for a building control visit in early October and the fast approaching onset of winter. So I’ve tidied the yard / sorted out firewood, repainted the wall behind the stove that was looking a little mucky, filled various holes in various walls and finished & filled little pieces of trim & gaps on and around the stairs and gallery landing. Painting of the internal door frames is now complete. 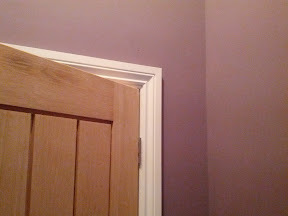 Undercoat plus three coats of eggshell and I’m happy with the finish. 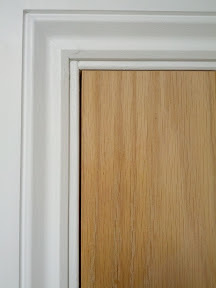 I’ve removed all the masking tape I used and sanded down the doors where a little wayward paint had landed, so job well and truly done and dusted. The utility room, the last room to be decorated, has now overtaken most of the rest of the barn in its level of completeness. Having been painted last month, I then installed skirting boards and have started installing shelving, using wood reclaimed from the animal stalls that once occupied the part of the barn where the kitchen is now. I started work on a large high-level shelf that will run at the same height as the top of the wall cupboards in the kitchen and help tidy up the slightly off centre vent pipe for the kitchen extractor fan and provide some more much needed storage. I’ve managed to sort out my EPC for the barn and the ‘HETAS certificate of compliance‘ that is needed for the stove and flue installation, so it’s been a hot month for documentation! 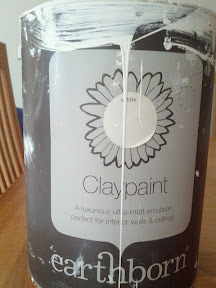 I thought that it would be worthwhile to record the brands and shades of paint we’ve used throughtout the barn, if for no other reason than to remind me when I come to repaint. This is our complete palette for now. 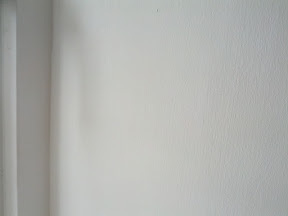 I like to keep things minimal, simple and fresh when it comes to the use of colour. I find strong, bold colours rarely pass the test of time when it comes to our ongoing enjoyment of and appetite for them. In keeping with my healthy house ethos, I’ve tried to use products that are as natural as possible and ensured minimal VOC content (Volatile Organic Compounds which are generally considered to be mildly toxic). 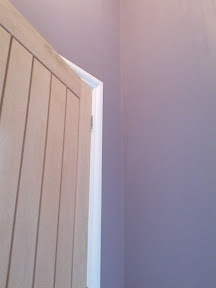 The only paint that I used, but have replaced with another is a soya based gloss paint that I used for internal woodwork, but proved to be of the wrong consistency to effectively cover prepainted skirting boards and architraves. 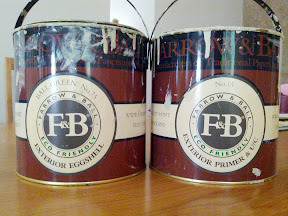 Colour: Farrow and Ball, Ball Green. 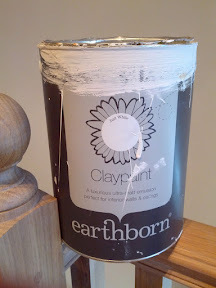 Colour: Earthborn Claypaint, Just White. 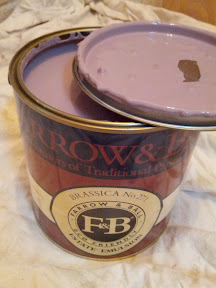 Colour: Farrow and Ball, Brassica. 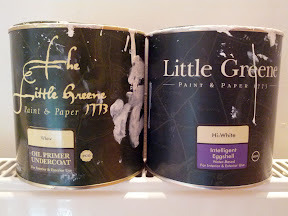 Colour: Little Greene, Hi-white eggshell.